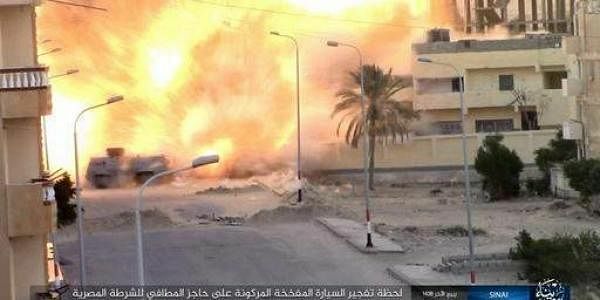 The attack came two days after Sinai militants killed 10 army soldiers and two policemen in Sinai. EL-ARISH: A pair of attacks by suspected Islamic militants on Saturday killed four policemen and injured six others in the turbulent north of Egypt's Sinai Peninsula, according to security officials, bringing to 16 the number of policemen and soldiers known to have been slain in the area in three days. They said three policemen were killed when their armored vehicle hit a roadside bomb south of Sinai's coastal city of el-Arish. Six more policemen were injured in that attack. Later on Saturday, a policeman manning a checkpoint also south of el-Arish was killed by a sniper's bullet, they said. The attacks came two days after Sinai militants killed 10 army soldiers and two policemen in Sinai. Northern Sinai, which borders Israel and the Gaza Strip, has long been home to an insurgency by militants, now led by a local affiliate of the Islamic State group. Attacks by militants grew deadlier and more frequent after the 2013 ouster of an Islamist president whose one year in office proved divisive. Mohammed Morsi was ousted by the military, then led by President Abdel-Fattah el-Sissi, following a wave of massive street protests against his one-year rule.